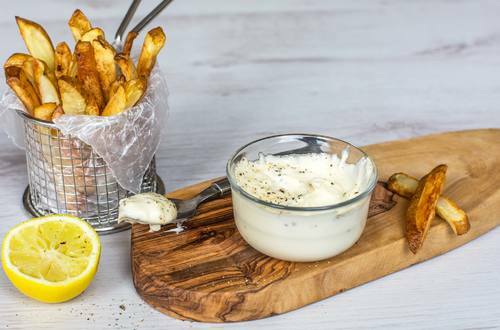 Fresh garlic and creamy Hellmann's® or Best Foods® Real Mayonnaise makes a great aioli recipe, perfect with meat or fish or as a great dip for fries. 1 Combine garlic with lemon juice in small bowl; let stand 10 minutes. 2 Process garlic and lemon juice with remaining ingredients in blender until smooth. Sprinkle, if desired, with ground black pepper. Serve with hot cooked chicken, fish, French fries, roasted potatoes or spread on sandwiches.